Shechita UK presented at the annual Public Policy Exchange Event at the Grange Wellington Hotel. With Brexit approaching, the forum discussed opportunities for new regulations on animal welfare, as new Primary Legislation will be necessary once Britain leaves the EU. Campaign Director, Shimon Cohen, took part in a panel discussion alongside Angela Smith MP, Peter Stevenson – Compassion in World Farming and Isobel Hutchinson – Animal Aid. 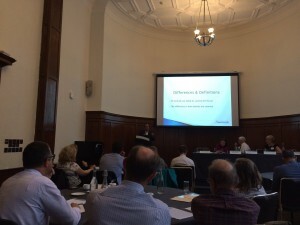 The Shechita UK presentation aimed to challenge many of the assumptions that bans within Europe had been enacted for animal welfare reasons, but rather, often motivated by population control. The presentation also looked to dispel many of the myths around mechanical stunning and stated that if there is to be new primary legislation post Brexit, Shechita UK would seek to have Shechita listed as a humane method of slaughter as it is in the USA.